What do your LinkedIn connections see when you browse their profiles? 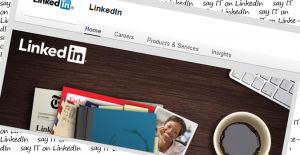 LinkedIn is not that much different than the real world… except that it is. You do not have the opportunity (not yet mind you) to walk down the street or enter a party and instantly see every person`s name, occupation, interests, educational background, work experience just hovering over their heads, therefore you do not get the chance to use an opening line like the one that you can see at the beginning of this post. Approaching someone on LinkedIn is that much easier exactly because of the detailed info you can see about them, displayed on their profiles. One thing that LinkedIn and real world communication have in common though, is that the opportunity for first impression only comes once, when you actually make the contact with someone you do not know in person. Baring this in mind, this early phase of connecting has to be recognized as a very important and unique moment that should be carefully executed. Here are some basic rules when it comes to making initial contact on LinkedIn – sending an invitation for connecting. 1. ALWAYS write personalized messages when hitting the “connect” button. Sending out an invitation request accompanied with the generic LinkedIn message “I’d like to add you to my professional network on LinkedIn.” does not give the impression that you really want to connect with them. 2. Use groups as a reference when you initiate contact with someone for the first time by choosing a group that you both are members of. This gives additional highlight to the point that you both share similar interests. In addition to this you can significantly upgrade your potential contacts reach by joining Linkedin groups relevant to your profession and interests. 3. Follow-up all accepted connections with a short “thank you” message. Here`s something you can use : “Thanks for accepting my invitation to connect, we`ll be in touch”. After you go through these steps you will hopefully gain yet another relevant LinkedIn connection and then you can start thinking about how to meaningfully engage with them.